CMX Media educates and empowers the world’s community professionals through events, editorial content, and training and workshops. When I came onboard, my primary responsibility was copy editing articles for the website. But as a team of two, the CEO and the COO had little bandwidth to think more strategically about their web content. Before long, it was clear that they needed content strategy and more streamlined editorial process for scaling content production. With larger projects and partnerships in the works, it was crucial that the company transition away from ad-hoc content development. I worked directly with the COO (previously, the Director of Content) to implement content strategy in a modular way. No clear audience needs and goals: They intimately understood their audience but that knowledge wasn’t made explicit in a way that helped them produce targeted content. Not sure if content was meeting business objectives: They had a vision for content but it wasn’t articulated enough to guide their efforts. It was hard to tell whether the content was contributing towards business metrics. Editorial process wasn’t scalable: They had a process for content production but it wasn’t organized in a way that was repeatable. Inefficient content production ate up time that could be spent on more strategic work. Their process wouldn’t be sustainable as the company grows. No clear line-of-sight from metrics, insights, and action: They used web analytics to measure content performance but they weren’t sure how to consistently integrate insights into business strategy and operations. 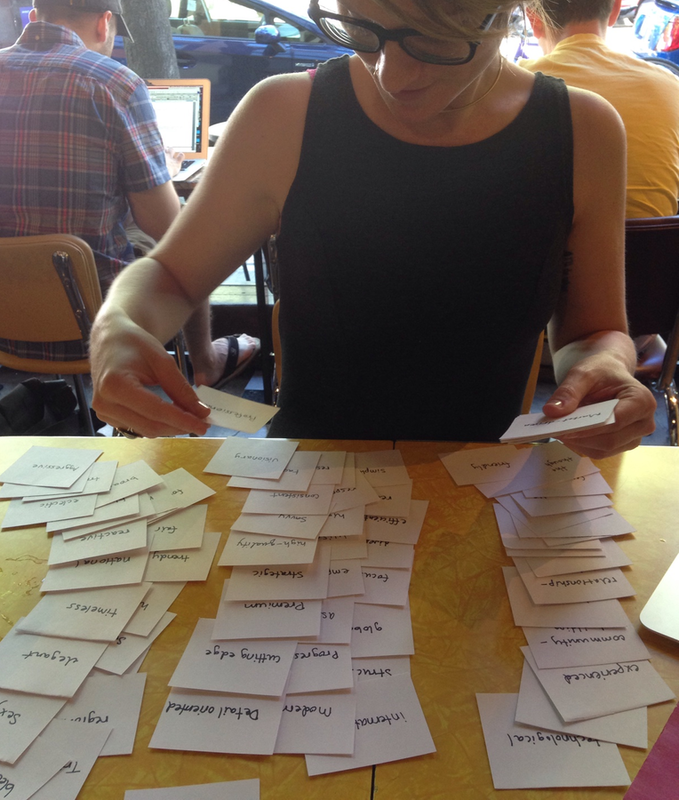 Carrie, CMX COO, doing a card sorting exercise to figure out CMX’s voice and tone and message architecture. Analyzed qualitative feedback from CMX Summit conferences, analyzed Google Analytics for top performing pages, and set up a process for member interviews. The COO and I developed 3-4 personas that we used to focus writing, editing, and editorial strategy. Performed keyword research and developed SEO strategy for articles. Identified business objectives, member needs, and content goals through workshop-style stakeholder interviews. 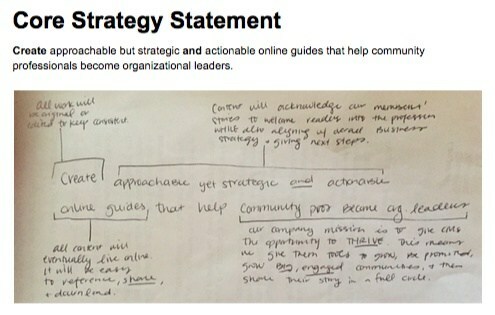 Developed a core content strategy that frames what each piece of content should accomplish. Then mapped content types to each stage of the marketing/sales funnel. Used card sorting to develop CMX brand’s voice and tone and message architecture. Developed a communication framework and high-level messaging based on the card sort. Documented everything in a style guide for all CMX content. 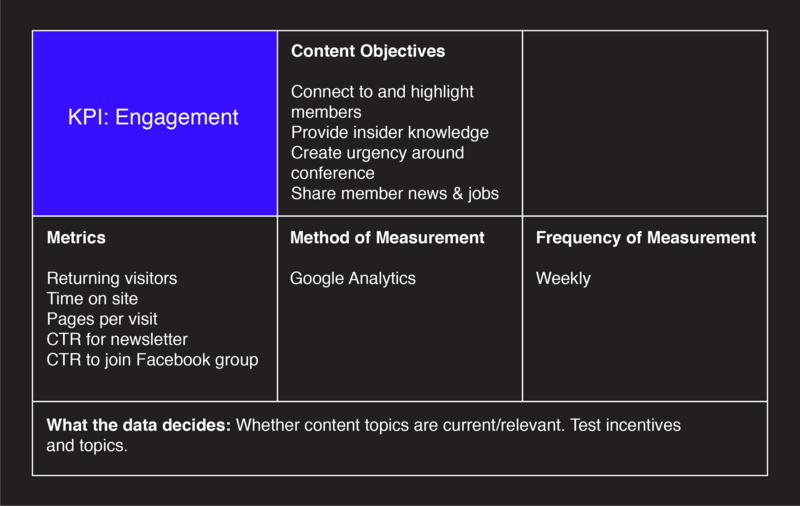 Created a process for how key content decisions are made and when to evaluate editorial plans. Created templates, checklists, and guides for writing articles and collaborating with contributors. Assembled best practices for things like writing headlines and repurposing older articles. Documented clear responsibilities for anyone involved in content production using a content matrix. Created a system to source ideas for articles and generate new and relevant topics. Created a measurement plan that clarified what to measure and why, what each metric tells us, and how to improve content based on insights. Segmented plan based on channels and content type. An example of a measurement plan for web content. We also defined metrics for Awareness content and Sales content. 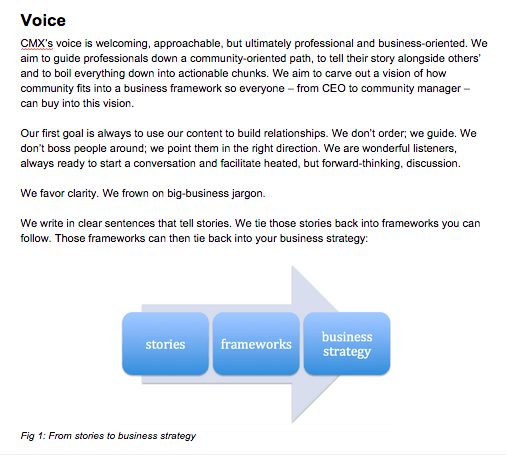 Created a minimum viable approach for implementing parts of content strategy. We adopted the content maturity model to plan “sprints” to improve editorial processes and go about it in an iterative way. One of the first things we tackled in our minimum viable approach was learning about members’ needs and creating personas. The ebook generated 50% open rate for the emails that promoted it, which is 30% higher than the main mailing list.